-The New Mid-Atlantic Sportatorium. Gibbonville, North Carolina. March 7, 2015. -Welcome! I’m running behind right now since Chikara took forever to release their March shows and because of other stuff I’ve got going on. 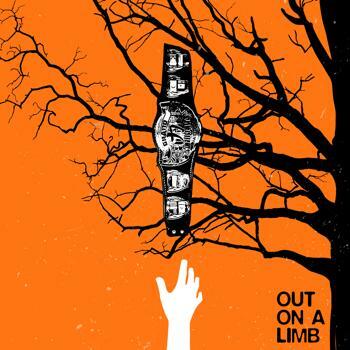 “Out on a Limb” was the first official Chikara show since “A New Start” in January. I decided not to review National Pro Wrestling Day 2015 due to its somewhat tenuous connection to Chikara. You can check out Kevin Ford’s excellent review here. – At NPWD, however, the Osirian Portal picked up their third point, leading to our main event tonight. Anyone else feel like the Campeonatos de Parejas has become a bit of an afterthought since the introduction of the Grand Championship? -I’m not sure what decade this event occurred in. The commentator audio was either coming through a 1920s radio or they were recording over CB. Breaker, breaker, it might be time to go back to SmartMark, over. -Challenge of the Immortals, the big Season 15 plotline, begins tonight! Long story short, the roster has been divided into 10 teams of four. All 10 teams will face the others twice in tag, trios, or atomicos action. No match type can be repeated when the two teams face each other the second time. Winners get one point, losers get none. The team with the most points at the end of the season wins. Every member of the winning team gets a title shot of their choosing. More details here from the good people/person at Chikara in 15 Minutes or Less. Overall, it seems like a pretty cool way to keep everyone involved and tell some good stories. -Lastly, we have a new recurring pre-show section. My friend Jeff (of Slazenger1) will be swinging by to drop a little knowledge on us regarding the Arrested Development episodes from which Chikara takes their event titles. There will be Arrested Development spoilers (indicated with bolded text), which I why I’ll put the spoilery parts last. If you are like me and still need to watch AD, skip to the first match! These two episodes of Arrested Development (“Out on a Limb” & “Altar Egos”) aired almost one year apart, but in true AD form, they are filled with references to one another. Watching them back-to-back highlights the fun parallels between season 1 and season 2 of this amazing show. In their respective seasons, they are each the first of back-to-back episodes featuring guest star Julia Louis-Dreyfuss as attorney Maggie Lizer. They also both feature, or refer to GOB’s wife, “Wife of GOB,” played by Amy Poehler, who happens to be a dealer of trained seals. These episodes are a great example of AD‘s clever use of foreshadowing and callbacks to create satisfyingly silly long-form storytelling. Of course, Chikara’s season 15 titles switched the order of the episodes, but they are so intertwined that they might almost work as well viewed backward. Fun Bit: Barry Zuckerkorn’s mirror moment. In “Out on a Limb” Buster loses a hand and (we’ll find out in the next episode, “Hand to God”), gets a hook. The episode also introduces Skip’s Scramble, and Buster learns that his uncle Oscar is actually his father. “A New Start” is from the 4th season, otherwise known as the one produced by Netflix that “resurrected” the show in 2013 (resurrection seems to be a theme for Chikara too, no?). One character on the show translated the phrase to a vanity license plate reading ANUSTART. So there’s that. Nothing like a four-way elimination tag match to get things kicked off. I had no idea that Princess KimberLee was a wrestler, but now that I’ve seen her in action, I’m a fan. Now all we need is for Jervis to stop doing “chivalrous” things that undermine her toughness. If she ever gets sick of having the ropes held for her and being awkwardly “rescued” in the middle of matches, it’s going to turn into an awesome heel turn. For real, though, this audio is absolutely reprehensible. You can’t listen and watch the match at the same time. Flex is also growing out his hair and it looks good, but weird. Early shenanigans led to a submission centipede that hilariously ended with Jervis tickling Flex and all the other competitors pointing and laughing. The rudos took advantage of the ensuing breakdown to take control of the match, wearing down Worker Ant for a very long time. After what seemed like forever, KimberLee and then Fire Ant cleaned out the ring. Rumblecrunch took control, but got so caught up in using some foreign object that Fire Ant rolled him up, eliminating the Wrecking Crew. Jakob went for the KO-Schlag (Can we start calling it that? ), but he blasted Pinkie Sanchez instead, allowing Jervis to roll up Jakob. It seemed like we were in for a tecnico showdown, but KimberLee pinned Fire Ant with an Alligator Clutch in fairly short order. Overall, this was an enjoyable match, although it never quite kicked into that next gear. Worker Ant took a loooong beating and the pins came fast and furious after the hot tag. A few more near-falls and a little more excitement might have benefitted the end of the match, but sometimes this is the right call to make, if for no other reason than to do something different so that nearfalls in other matches become more believable. We got a little promo from Hallowicked about his Challenge of the Immortals team. Silver Ant just wants to win, but Hallowicked seems to want to bring Silver Ant into their fold. I can’t tell you much about Argus, other than that he’s a graduate of the Chikara Wrestle Factory. The commentators probably had more to say about him, but the sound quality was so bad I couldn’t make it out. Argus, master of the “Gekko-Roman” style, seems to be a little more ground-based in his approach. He’s still green (LITERALLY! Sorry…), but he looks like he’s got a lot of promise. Argus made the rookie mistake playing to the crowd and Hallowicked took advantage, winning with the Yakuza Kick. The match and story were exactly what they needed to be. It wasn’t nuts, but it was a good showcase for Argus and a good chance for him to get some work in with a skilled opponent. Speaking of Hallowicked, I like what they are doing with him right now. He’s not cheating or taking shortcuts or using foreign objects. He’s the same sportsmanlike wrestler, only now he’s serving an unknown dark lord and hates UltraMantis. I appreciate Chikara’s ability to change wrestler alignments without completely undoing their characters. This was a great choice to kick off the tournament, even if it didn’t quite come off the way they envisioned. Silver Ant started the match with some technical wizardry. Icarus couldn’t keep up on the mat and Touchdown couldn’t outmuscle him. Frightmare came in next, bouncing off and around Angelosetti. Frightmare and Icarus had a weird sequence where Icarus played the 450 pound man who couldn’t be taken off his feet and then did a backflip for a Frightmare clothesline. Pick one or the other, Icarus. Icarus wasn’t quite on the same page as everyone else, but any time Touchdown was out there, particularly with Silver Ant, it was incredible. The two reversed each other constantly, one with power and the other with skill. Icarus hit a Super Hurricanrana on Silver Ant, leading to an extensive pin-reversal sequence which Icarus eventually won. This was an incredible match on paper, but no combination other than Silver Ant/Touchdown reached its true potential. Unfortunately, it was too sloppy to recommend despite the incredible talent involved. Like his PWG matches, Trevor Lee fought from underneath until he made his comeback. As opposed to his “Thunderball” match, however, Lee got to bust out his entire arsenal. Both guys beat the dog crap out of each other, throwing some very convincing punches, kicks, and stomps. Lee blew up the crowd when he hit that mid-air powerslam thing he loves so much. After some awesome nearfalls, Chucky T hit the Awful Waffle for the win. This was one of Chikara’s best singles matches in the last couple of years and an easy choice for match of the evening if there wasn’t a Campeonatos de Parejas defense later. It was fast-paced, hard-hitting, and incredibly fun. For all of Chikara’s merits, they rarely allow a couple of guys to go out and unhitch the plow for ten minutes. They made the right call by letting these two do just that tonight. As far as I’m concerned, Chuck Taylor, this time as Mr. Azerbaijan, won “Out on a Limb” when he began the UN’s promo with “Ladies, gentlemen, small children, farm animal…” Oleg the Usurper got some big cheers now that he is with the tecnicos. There’s gonna be some great character stuff when the Arcane Horde takes on the Wrecking Crew. This one was fast-paced from the get-go. Everyone flew around a little before the United Nations isolated the Batiri. The match broke down after the UltraMantis hot tag, allowing Oleg to clean house, much to the delight of the crowd. A wild Sidney Bakabella appeared, however, to remind Oleg of something in his contract. Oleg was distracted long enough for Juan Francisco to German Suplex him for the win. This match had great wrestling and interesting storytelling, although the poor audio prevented me from better understanding the big deal with the contract. Oleg vs. Bakabella will result in an exciting face turn, but the other Arcane Horde storyline is tougher to predict. UltraMantis has a lot of negative history with the Batiri. The Flood and this draft might have made them teammates, but they sure aren’t allies. The dissension here could go in a million different directions and I’m looking forward to it developing as the season wears on. Dasher, once again, showed why he was my Chikara MVP last year. After Bryce checked Condron for his pipe wrench, Dasher asked him to check again. When Bryce couldn’t find anything, Dasher looked under the ring himself. Isn’t it amazing when wrestlers demonstrate they are paying attention to their own lives? Dasher is the perfect foil for Condron at this stage in Kevin’s character. Condron, having beaten Eddie Kingston at “A New Start” with the Eddie Guerrero Special, tried to frame Dasher for cheating too. 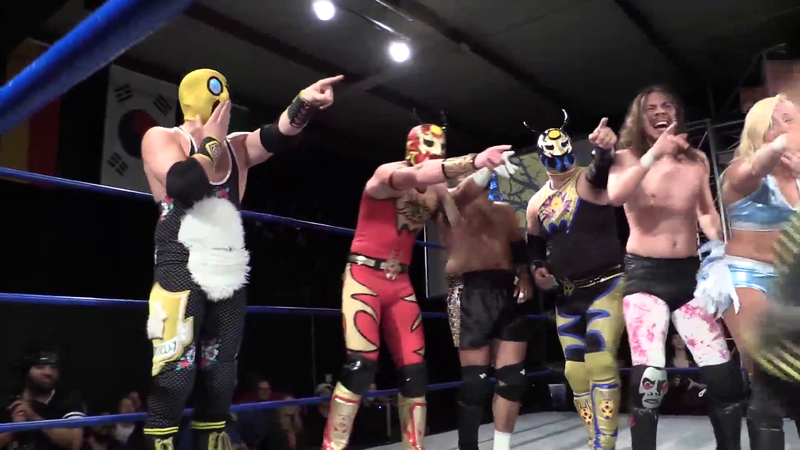 What Condron hasn’t learned yet is that Dasher is the LAST person in Chikara who would stoop to such things. As a result, Bryce doesn’t believe Condron. When Condron leapt to his feet in protest, Dasher rolled him up for the win. In any other promotion, the referee disqualifies the hero and forgets that all Condron’s shenanigans are on MP4. 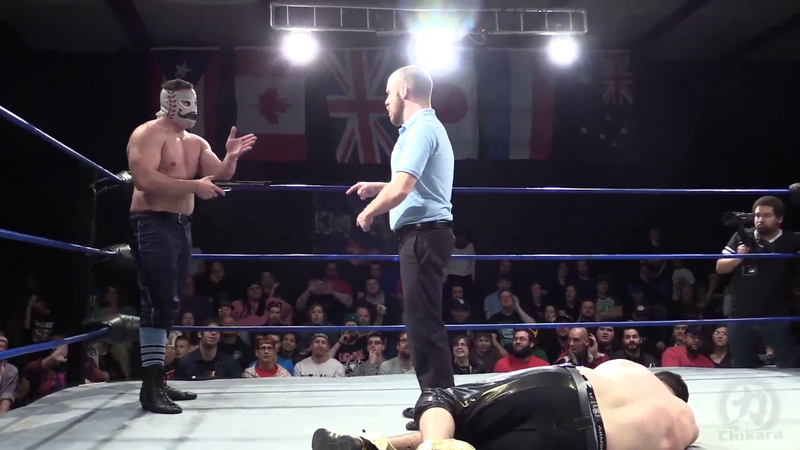 Chikara has established, given the context and the characters involved, that there is no reason for Remsburg to believe Condron. So, he doesn’t. Condron still hasn’t had a chance to show off his wrestling chops, but his character work was on point again. Tonight, he learned that he has to change up his game if he wants to take shortcuts. He lives in a dynamic universe with dynamic characters. If he wants to hang with them, he’s going to need to be dynamic too. I’ve probably explained my love of 2 out of 3 Falls Matches enough, so I’ll refrain from doing so again. All I’m saying is that Max Smashmaster with hair will stop being weird long before we get a lousy 2/3 Falls Match. This one certainly did not disappoint. The Osirian Portal came out firing, using their quickness to keep the Devastation Corporation on their heels. Ophidian and Amasis countered a Blaster McMassive powerbomb into a double pin for the first fall. The Devastation Corporation almost walked out on the match until Bryce threatened to strip them of their titles. The rest period ended before Amasis could tag in. The rudos lazily picked apart Ophidian until Amasis came in like a house afire. He took down Smashmaster with a Cobra Clutch and McMassive with a series of kicks. Amasis’ 450 Splash and a Smashmaster Swanton both earned two-counts. The crowd went nuts as a signature barrage reset the match. Osirian Portal climbed the turnbuckles for the Osirian Sacrament, but Sidney tried to stop them with his roll of nickels. Ophidian blasted him with the red mist and the two connected with the Osirian Sacrament! 1-2-No! The Osirian Portal was in complete and utter shock. Smashmaster tossed Ophidian out of the ring and a Death Blow sealed the deal. This match was almost perfect and all the way amazing. The Osirian Portal looked fantastic and hit the Devastation Corporation with everything they had. Both teams looked gassed by the end of the match. They weren’t, of course, but they made you feel like both sides were throwing everything they had at the other. That’s why I loved the finish so much. The Osirian Portal had given everything they had to get Blaster with the Osirian Sacrament. When he kicked out, the Osirian Portal was done for. They had no idea what to do next and had nothing left in the tank even if they did. Fantastic storytelling. The only negative is that it seems like the match went one kickout too long. The crowd really deflated after the Osirian Sacrament kickout and I don’t think that would have happened if both sides hadn’t already kicked out of finishers. 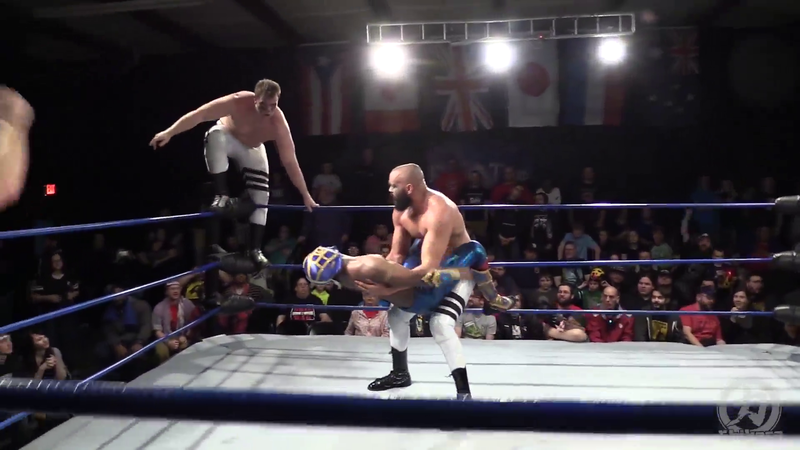 The Chikarmy’s suspension of disbelief is a lot closer to WWE’s than Ring of Honor’s. The Campeonatos de Parejas match was amazing and the rest of the wrestling was decent to great. The Challenge of the Immortals is a neat idea and I like just about everything about it. There’s a thousand and a half great stories Chikara can tell throughout the tournament, both between teams and between teammates. Plus, I just don’t think the premise of “Do this and get a title shot of your choosing” is done enough. Unfortunately, I can’t recommend anything with sound quality this bad. It’s 2015! There is no excuse for audio this bad, especially after so many seasons of clear, well-mixed sound. If they’ve parted with SmartMark, it might be time to go crawling back. Things got slightly better after the first match, but not anywhere near acceptable. At least the video was back to Chikara’s standards. For the Wrestling? Yes, particularly the second half. For the Story? Some seeds were planted, but that’s it. For the History? This one had the first title defense for the Devastation Corporation and the opening matches of the Challenge of the Immortals Tournament. They are both noteworthy, but I’m not sure either one would be enough to earn a “yes” in this category. This entry was posted in Professional Wrestling and tagged Argus, Campeonatos de Parejas, Challenge of the Immortals, CHIKARA, Chuck Taylor, Dasher Hatfield, Devastation Corporation, Icarus, Kevin Condron, Mr. Touchdown, Osirian Portal, Out on a Limb, Princess KimberLee, Trevor Lee by Rites of Patches. Bookmark the permalink.